The Main Gate project provided a new Access Control Point for the Plum Brook Station campus of Glenn Research Center near Sandusky, Ohio. The work included a new Visitors Center building with security offices and visitor badging , a main gate check point canopy, vehicle inspection building, new parking lot, access drives designed to slow the flow of traffic and prevent a rush on the gate, crash resistant fencing and K-rated barriers, associated site development and utility installation. The design process included extensive coordination with the Glenn Research Center Physical Security Office in order to address their special requirements and security procedures. NASA desired a unique approach to the scheme that met all of the security requirements and delivered an iconic design creating an identity for the Plum Brook Station campus. Sustainable design was used as a framework for design decisions throughout the project. Emphasis was placed on sustainable strategies that would provide the most results for the effort including energy efficiency, day lighting and site water management. 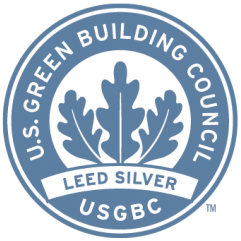 Targeted for LEED Silver, the building envelope and mechanical and electrical systems were designed to further reduce energy consumption in order to reduce the demand on future renewable energy sources.